Last Saturday it was time for the September edition of Awakenings. 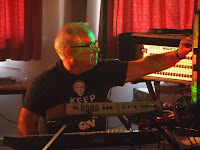 The electronic music event, where I performed twice before (a solo performance in 2012, and with Free Arts Lab in 2014) at the previous location in Burton-on-Trent, is now being held at Lea Hall Social Club, in Rugeley. A smaller and more intimate venue than Paget High School. Petter Janse and I were invited to perform here with Mäläskä last weekend. We departed from The Netherlands on Friday morning, September 15th, took the ferry from Duinkerken, and overnighted in Folkestone, just south from Dover. The next day we drove to Rugeley, while having a lot of heavy traffic on our way. Anyway, we were in time to get our equipment installed. 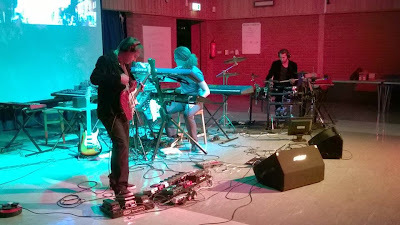 The first concert, by Sinewaves Light started at 18:10, and ended at 19:00. 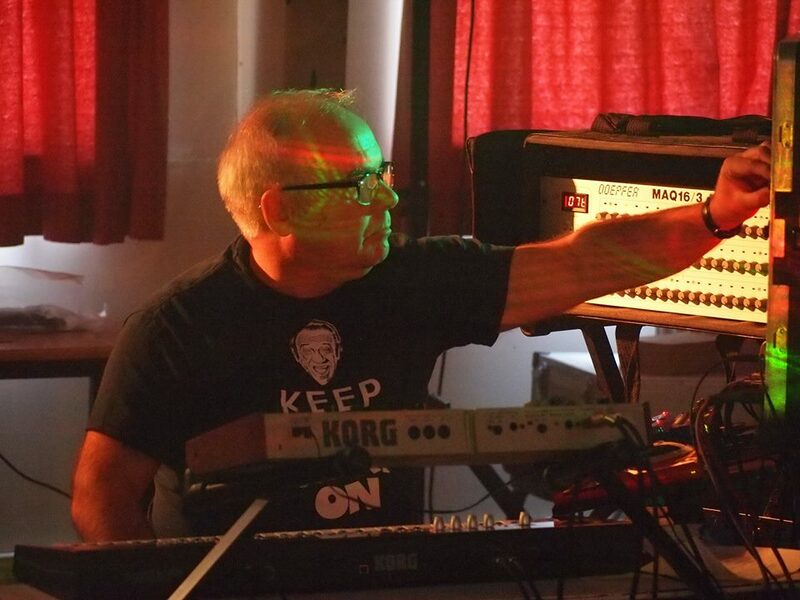 Mike Parrott exposed a wide variety of different touches of electronic music. Despite the fact that the performance was technically sloppy from time to time, it contained some really good parts and themes. Very enjoyable. The different tracks were clearly inspired by (or at least they contained clear comparisons with) the music of John Carpenter, James Horner, Vangelis, Jarre, and also featured some serious Berlin School sequences. 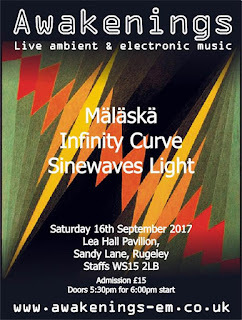 After the first break of half an hour, routiniers and frequent Awakening performers Jez Creek and Peter Challoner debuted as Infinity Curve. 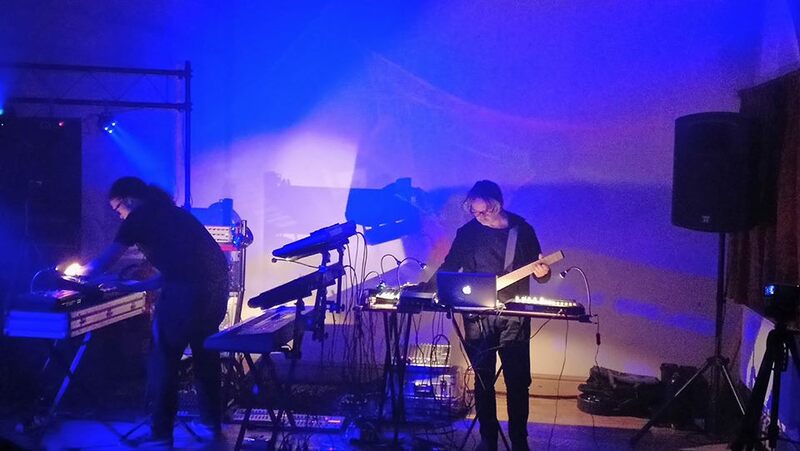 Some dark and sinister ambient sound sculptures kicked off their one-hour set. Subtle evolving and constantly emerging layers made this a very delightful and exciting listen. After ten minutes a sequence appeared and evolved into some nice uptempo ambient. From time to time some very subtle solo leads in the background, and also more than enough happening constantly, by means of sound effects, structures and samples. After every following sequence part, another ambient passage made the bridge to the next sequencer sections. Excellently balanced, great sounds, interesting layering, and brilliant sequencing. Really awesome! Then another 30 minutes break (in which we checked the final technical things) before Petter and I made our appearance. We set off with some soundscapes, after which the first sequencing was done. Alternated with atmospheric passages. A short impression from the first part of our gig can be seen here. After a little longer than one hour we finished our set. At that point Petter suggested that I should do an encore on my own. So I started an improvised piano piece. Ending up with some more sequencing. No idea what our output sounded like, but I will listen to the recordings within the coming days. Unfortunately it was not the best visited edition of Awakenings ever. On the other side, many people did buy a virtual ticket, and supported the event this way. Which is much appreciated. In any way we have had a great weekend; it was really good to be back! Thanks to all who visited the concerts, and bought virtual tickets. And many thanks to Phil Booth, Dave Buxton and everyone involved. Galactic Travels is an electronic, ambient, and space music show that airs each Thursday at 11 p.m. EDT (which is 5 a.m. CEST, Amsterdam time) on WDIY 88.1 FM , Allentown and Bethlehem, 93.9 FM in Easton and Phillipsburg, 93.7 FM in Fogelsville and Trexlertown, and on the internet at http://wdiy.org. Mäläskä - the improvisation project together with guitar player Petter Janse - are invited to play at the Awakenings concert series in Rugeley, U.K., September 16th. Free Arts Lab live at the Awakenings All-Dayer, 11-10-2014. 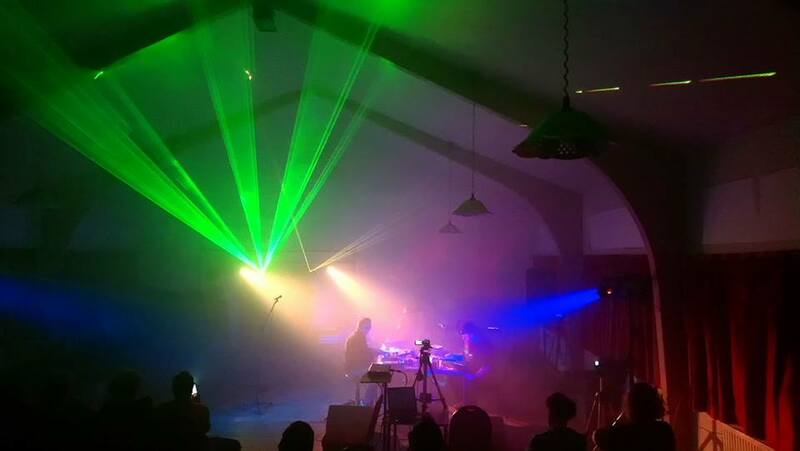 Petter and I already performed here (although on the previous location of Burton-on-Trent) with Free Arts Lab in 2014, and I debuted with a solo concert back in 2012. 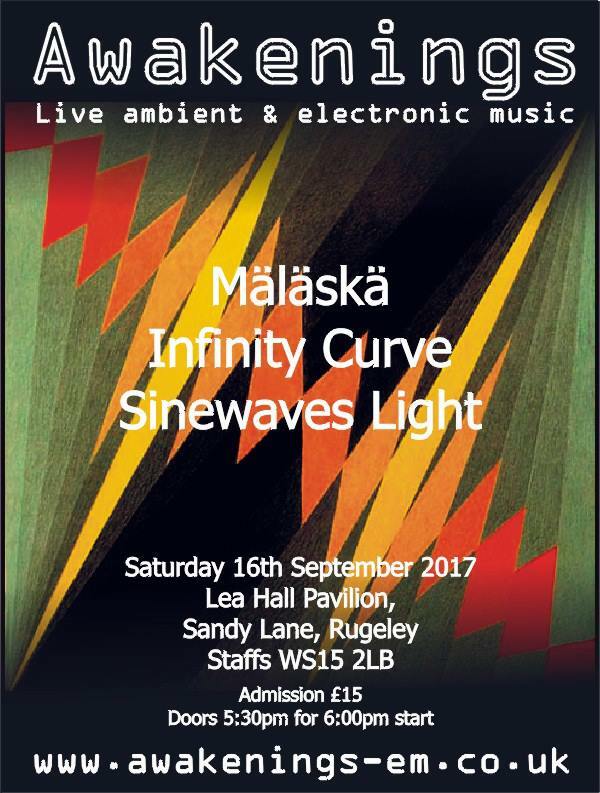 This edition's complete line-up also includes Infinity Curve and Sinewaves Light. In the meanwhile I am preparing visuals. The hard part of this is that we never know the output of our gigs in advance, so hopefully I can manage to create something that fits within the development of the things we are going to create live. Last week Petter and I already made adjustments in our setup, and later this week we will have a final rehearsal. Note that every ticket includes virtual ticket. Which means you will get the recordings of all performances in your mailbox afterwards. So if you buy a ticket, even if you are not able to attend the event, you directly support all performing artists. And you get something exclusive in return.